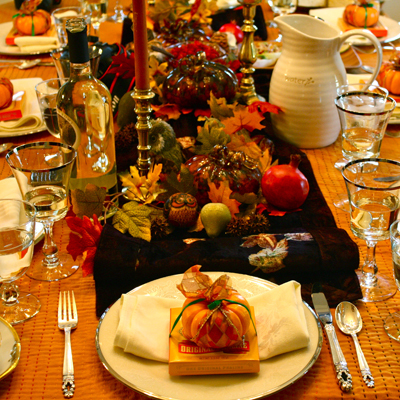 Thanksgiving is not about sitting around eating too much food with family that you may or may not even like. Thanksgiving is about being grateful for what you have, even if it a mere pittance compared to others. Being grateful you woke up that morning. Grateful you are employed, or if you are not, that you were able to scrap together enough to keep going until you find a new job. Grateful for the people in your life who pick you up when you fall, and even grateful for those who don’t because it reminds you to be more kind than they were. I am grateful that my 80 year old mother is still fighting her 13-year battle with lung cancer, even when she is driving me crazy. And before the judgment begins, no she was never a smoker. Ever. According to Cancer.net, lung cancer is the leading cause of cancer deaths in women. Environmental factors, such as exposure to secondhand smoke, radon, and asbestos. Doctors call lung cancer in women an epidemic, and they are looking for differences in lung cancer between men and women. So mom continues to fight her fight, and is grateful for every day she has. Especially every day she can spend with her precious granddaughter. Even when that precious granddaughter is driving her crazy. I am grateful I have a wonderful 4 year old daughter, who may try my patience once in a while (all right, every day) but I know how blessed I am to have her. Being a single mother is the hardest job in the world, but I would not change a thing. Except maybe I would win the lottery once or twice. I am grateful for my friends, many of whom have been friends since we were in high school, junior high school and even elementary school. I am grateful for my new friends, especially my food blogger friends. Many a relationship was formed through Twitter and food blogger conferences. Some became friends before we actually met in person, we were “virtual” friends on the internet. But that relationship is no less real than one formed on the playgrounds of youth. I spent an incredible day with a group of food bloggers, breaking bread, laughing and toasting the joy of our friendships. We had an early Thanksgiving, filled with good food, great people and smiles. Just like a family Thanksgiving. 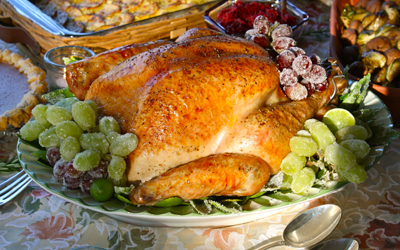 Here is a list of links to all their delicious recipes, all worthy of your Thanksgiving table. Or anytime for that matter. SALAD — Endive Boats with Avocado, Pomegranate and Crab Salad from Rachael Hutchings of the blog La Fuji Mama. POTATO – Garlic and Herb Potato Gratin from Dorothy Reinhold of the blog Shockingly Delicious. SIDE — Spiced Roasted Winter Vegetables from ME! DESSERT — Kahlúa Sweet Potato Pie with Kahlua Whipped Cream from Patti Londre of the blog Worth The Whisk and our Thanksgiving Blogger Potluck Project Manager. Wow–I’m a blogger who just clicked on your blog from an LA Times article and the first thing I read about was your mother. My mother passed away from lung cancer in 2004. It’s a terrible illness, and your mother must be very mentally and physically strong to fight lung cancer for 13 years. Peace and love to you both. Love your blog!!! It is beautiful. Sorry to hear that Mira. You tell your mom to not give up and to keep fighting! And your job is to keep cooking for her, because a simple meal can mean more than you know. beautiful… learning to be grateful is the first step to a bountiful life!!! Happy Thanksgiving to you and your loved ones. Too often we forget to stop and take stock of everything we have to be grateful. Sometimes we have to readjust the way we look at things to be able to do that. That being said, it’s not hard to be grateful for you! What a blessing you are to our community. Hugs my friend! 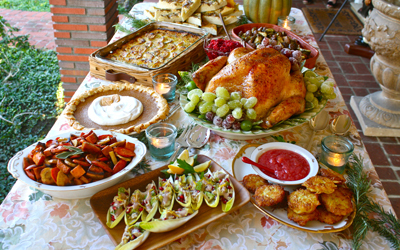 What a beautiful Thanksgiving spread! I try too, to be thankful all year long, even when my family is driving me crazy! 🙂 Thank you for sharing your words of gratitude and your early T-giving yumminess! I can only smile when I think of your mom fighting this horrible disease for 13 years – Brava! My mom is a fighter, too, and I hope she can resist her cancer for at least a fraction of that time. To our brave mothers, cheers! Beautiful food — and beautiful sentiments! Gratitude changes everything… So happy to have spent Thanksgiving with you. You KNOW how much I loved your delicious roasted root veggies, because I had 2 servings. I am very glad to have met you in blogging, and look forward to another great foodie year. See you soon!